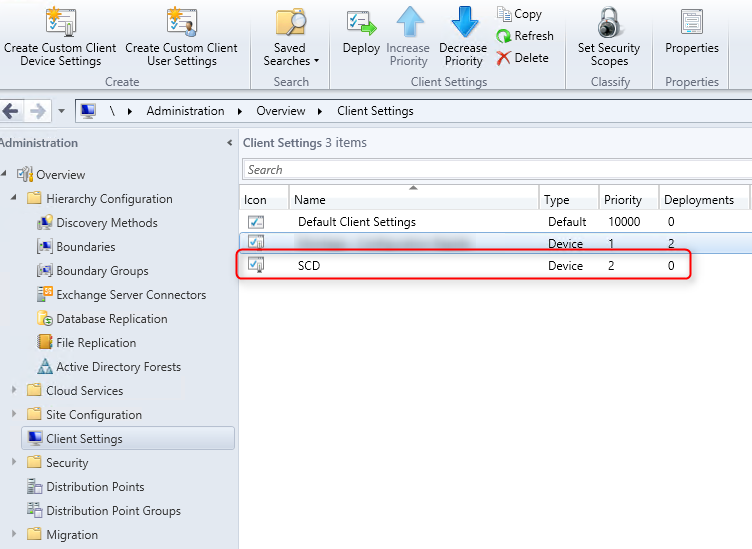 This blog article will explain how to create a custom SCCM 2012 client settings and how to deploy it. In the first parts of SCCM 2012 and SCCM 1511 blog series, we covered the complete SCCM 2012 R2 and SCCM 1511 installation. In the final parts, we will cover the basic SCCM configuration starting with client settings. 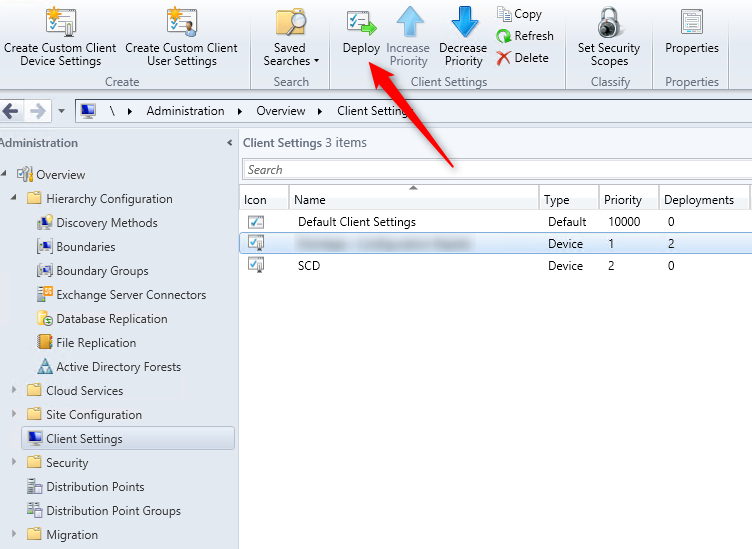 In previous versions of SCCM, client settings were specific to the site. You had 1 client settings that applied to all your hierarchy. 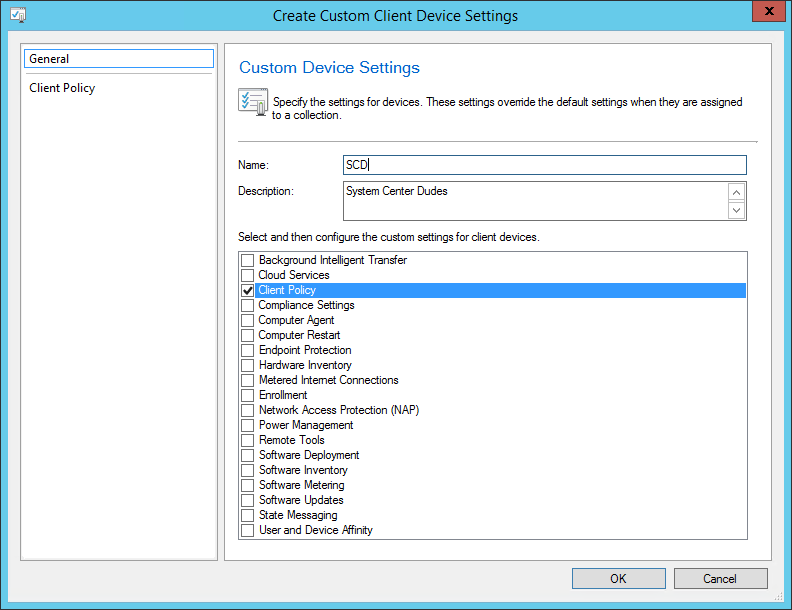 In SCCM 2012 you can specify clients setting at the collection level. You can have different settings for specific collections, overlapping settings are set using a priority setting. When you modify the Default Client Settings, the settings are applied to all clients in the hierarchy automatically. You do not need to deploy the Default Client Settings to apply it. By default it has a 10000 priority value (This is the lower priority). All others custom client settings can have a priority value of 1 to 9999 which will always override the Default Client Settings. (The higher Priority is 1). We won’t explain each client settings and their descriptions. The Technet documentation is pretty clear and many of the client settings are self-explanatory. We cannot make any recommendation either as each environment has its own needs and limitations. If you have any questions concerning a specific setting, use the comment section and we’ll try to help you so you can make the right decision for your organisation. When you deploy a custom client settings, they override the Default Client Settings. Before you begin, ensure that you created a collection that contains the devices that requires these custom client settings. For our blog post, we will set the Client Policy polling interval to 15 minutes. When you create a new client settings, it automatically take the next available priority. (Beginning with 1) Before deploying it, make sure that your priority is well set for your needs. A higher priority (1) will override any settings with a lower priority. (9999). Don’t get confused 1 is higher ! Now that your client settings is created, you need to deploy it to a collection. This new client settings will apply to only this collection and depending of the priority, will override the settings. 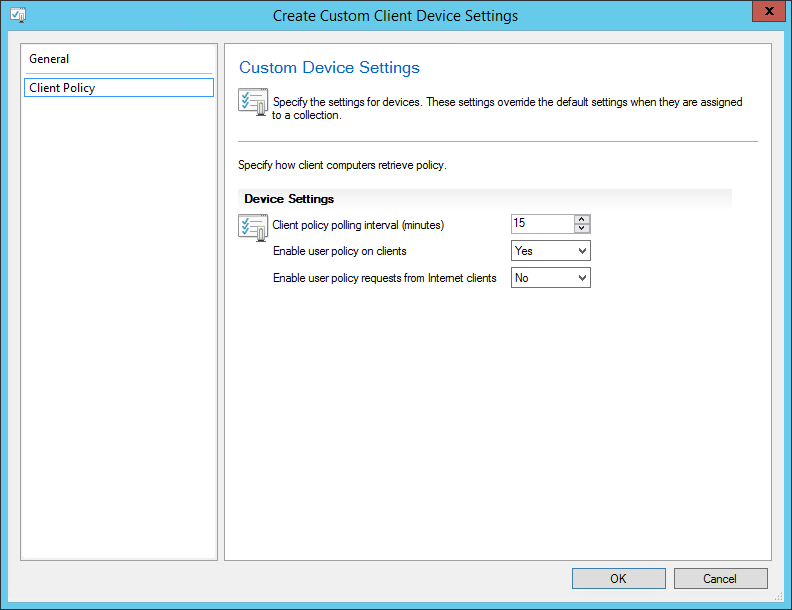 Client computers will apply your custom settings when they download their next client policy. You can trigger it manually to speed up the process. It’s possible to see which client settings are applied to a specific client. 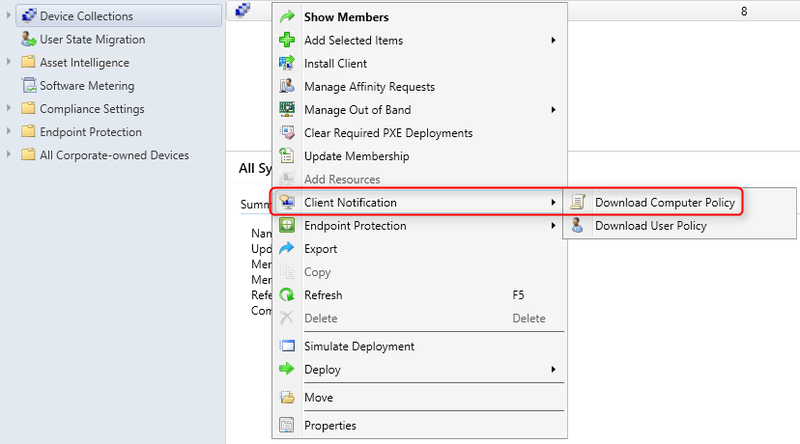 You must use the Resultant Client Settings function in the SCCM console. We already cover this in a previous article. 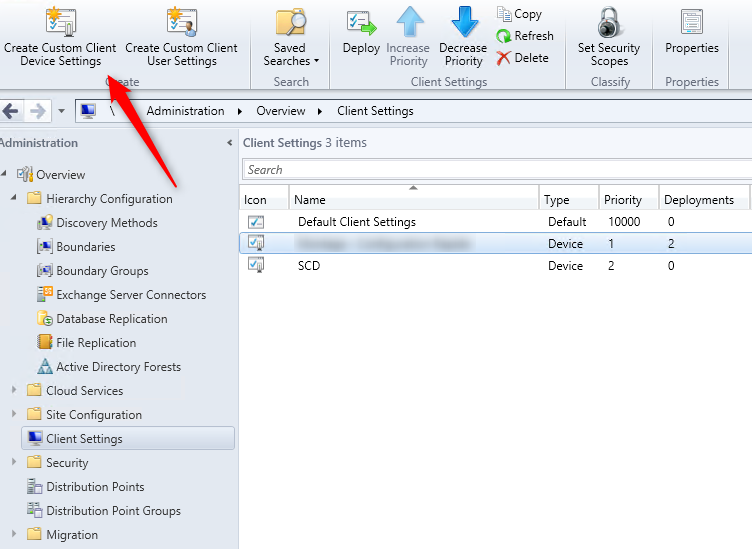 That’s it, you’ve created your first SCCM 2012 client settings, use the comment section to leave a question or comment. Really like the write-ups on your site. Have been following you for quite some time. 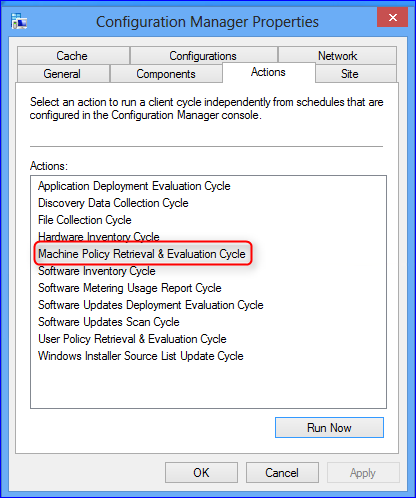 Client Setting ‘A’ defines the configurations/settings for Software Updates, Computer Agent, Computer Restart and Client Policy. Priority -10. Computer Agent, Computer Restart and Client Policy have the same configurations in both, ‘A’ and ‘B’ client settings, so I know settings defined in ‘A’ will be applicable. Now the question is, will BITS come into picture during the communication of clients with MP at the time of Software Updates Installation or Software Updates download/installation will avoid the BITS settings deployed through Client Setting ‘B’? Here is an interesting problem. 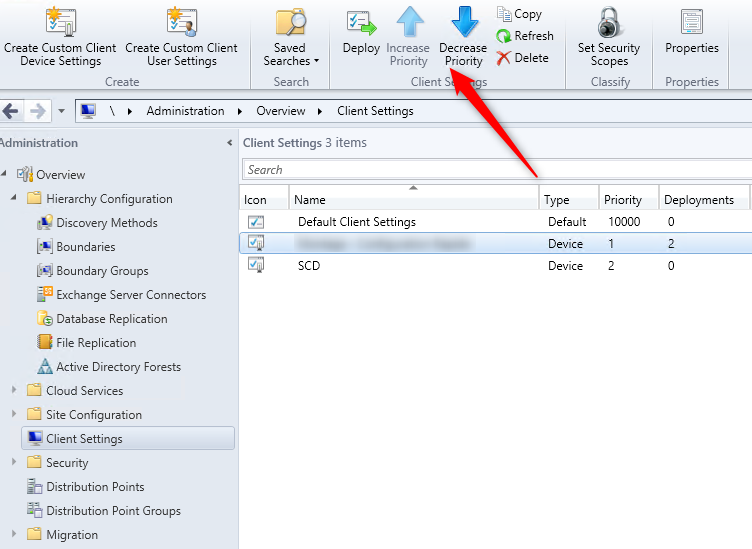 When I initially rolled out SCCM I created a custom client settings this was applied to the all systems collection. I have created a second custom client settings with SCEP enabled for testing since we will be moving to SCEP next year I have to make sure our current EP app will be uninstalled by the SCCM client. I have deployed the SCEP enable client settings to a test device collection the new settings are listed on the collection and on each device so the settings are applied but not superseding the original All systems settings. I considered changing priority in the client settings windows but do not want to adversely affect the other 1700+ computers. Our environment is pretty simple for SCCM use and I have never needed to test alternative client settings. I guess the simple question is can I change the priority of the new test settings which are applied to only one device collection without adverse effects on the remaining infrastructure? Using the GUI is straightforward, but how can one apply custom client settings to a new collection using Powershell? Could you please point me in the right direction. Am struggling with client deployment on a mixed hierarchy(2012 & 2016 CB) environment.